Aaron Renn's recent post on Philadelphia made me think of a few of the qualities that make it so unique. The other large Northeastern cities, New York, Boston, and Washington DC, have all followed similar tragectories: seemingly permanent urban decline followed by a drastic recovery. These trends apply to Philly as well, but it would seem they have taken a different form. Aaron explains the fabric of Philly as being a collection of small towns without a real city identity. Steve W, in one of the comments, further explains the relationship between the University of Pennsylvania and West Philadelphia. One could see this in stark contrast to the relationship Columbia and NYU have with their surrounding neighborhoods. 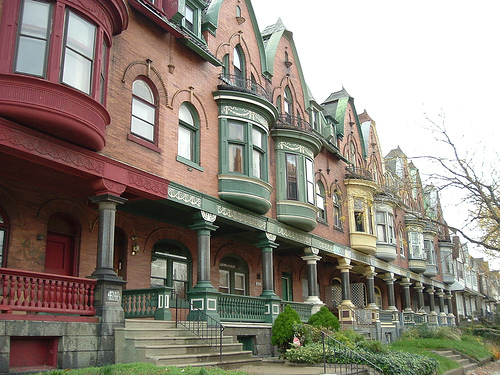 Alan Ehrenhalt devotes one of the chapters of The Great Inversion to Philadelphia, and explains another unique character of Philadelphia: its concentration of row house homeowners. Moreso than any other comparable city, Philadelphia is a city of families who own their own row houses. Alan describes how in our new reality of demographic inversion, this hinders large scale developers which are more successful in other cities. In Philly, a single holdout is more likely to impede the development of a large scale modern apartment building in an improving neighborhood. While I wouldn't argue that Philadelphia was a safer place to be in the 70s than New York, Boston, or DC, I'd say its trough could be more compared to Detroit. In terms of the positive change, Philadelphia is still an anomaly on the east coast. It remains the cheap option to those who want the large city urban east coast experience. Even the most expensive neighborhoods in center city are extremely affordable when you're comparing them to other large cities in the Bos-Wash corridor. Of course this also means the poorer neighborhoods of Philly are more destitute than comparable neighborhoods in other cities, so while displacement hasn't happened to the degree it has in other cities, there isn't as much in city opportunity available to people from these marginal places. This podcast did a great job explaining a lot of things: The origins of high frequency trading, the absurdity of financial regulation made from the point of view of a bygone era, and the absurdity of high frequency trading today. High frequency trading has (rightfully so) been under intense scrutiny since the near collapse of Knight Capital and the previous afternoon long flash crash. High frequency trading is not bad as a concept. If the market reacts to data a day later, and you find a way to react in half a day, you have a more efficient market. You're essentially "oiling the gears" of the stock market. The problem lies in the incentives: they're winner take all. If I come up with that improvement, I get all of the value from my information edge as the market adjusts to normalcy. And if someone jumps ahead of me to react in an hour rather than half a day, they get all of the value. There is absolutely no mechanism to stop this from devolving into a destructive arms race, which is obviously happening as HFT companies are now fighting over milliseconds, and going to extreme lengths to get that edge. The marginal benefit of these increases in efficiency decline, but it's not reflected in the incentives. It's a good thing to take a process that normally takes a day and reduce it to an hour, but the efficiency gain in reducing this process by a millisecond is minuscule. There should be more regulation to correct this error. Some firms should specialize in high frequency trading, but they should not be encouraged to fight over such trivial time differences. I'm not sure what sort of policy would best fit this problem, but it does need to come from a place where it addresses this exact issue. This is only one of several problems that exist in our current financial system, but I believe it's a good example of how these problems should be approached. Instead of letting populist feelings guide thought around the regulation of the financial industry, policy makers should be looking for these misaligned incentives that are the true cause of wall street malfeasance.